Summer is all about being outdoors. Anyway we can think of to get outside, we’re going to try. So summer, Fourth of July especially, includes eating outside often. Picnics are simply a necessary part of the season. We’ve shown you some great picnic food ideas this spring, the cauliflower potato salad and watermelon onion salad are continuing favorites, but we also wanted to clue you into other great outdoor ideas that you can use for picnics. 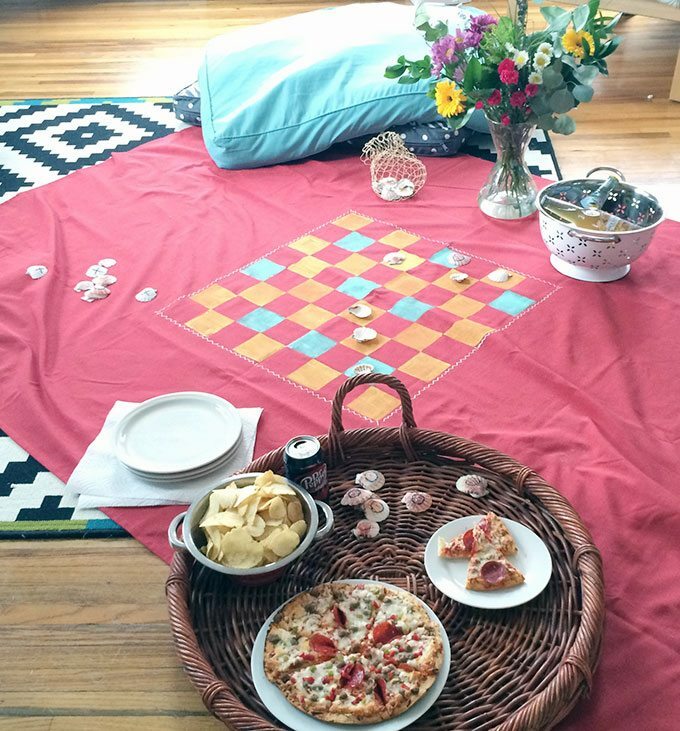 This picnic blanket game board is one of our favorites. (You saw it in the background of our pizza picnic party). My family plays chess. I even ran an after-school chess club for quite some time. 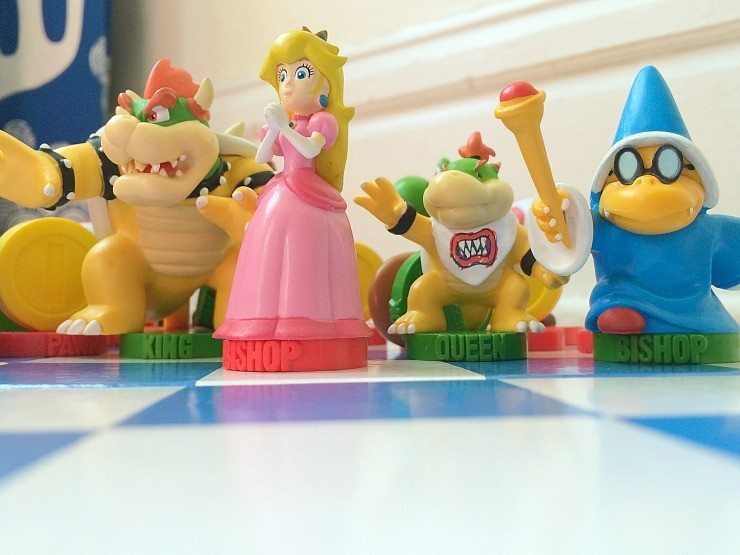 One of Levi’s favorite gifts from his aunt was his Mario Bro’s chess set. It’s used all the time! We don’t just play the game. We strategize, we know the special moves and all the actual rules. But when the sun is shining and the temperature is great, we want to be outside. We are willing to set aside dishes and laundry for those few special moments with family in the sunshine. We believe in taking those moments as they happen because dishes are always there, aren’t they? 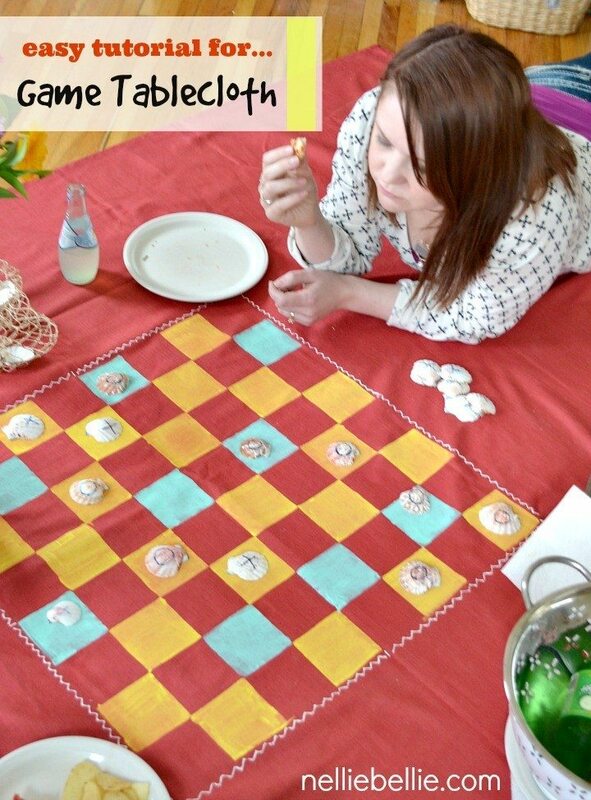 I came up with this really easy idea for a picnic blanket game board that has a built-in chess and checker board. I used fun sea shells for the pieces (easy to find at your craft store or on Amazon), but anything would really work. You can use rocks, plastic saucers, small toys, large beads, even wrapped candy as game pieces. 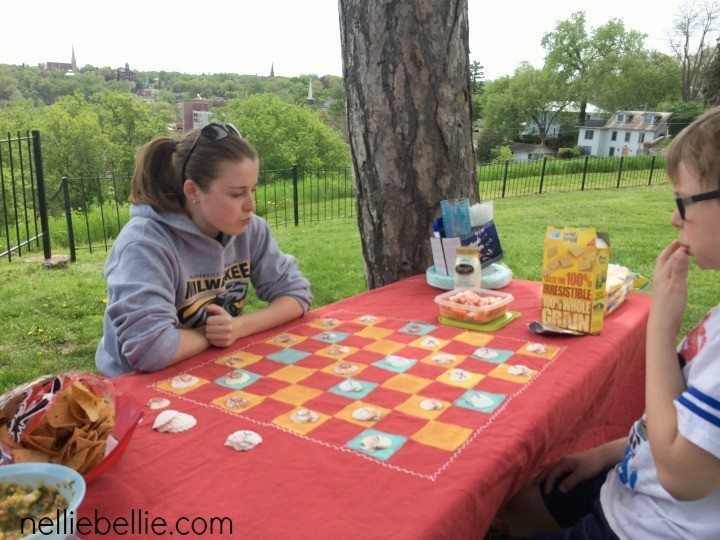 Never use “we don’t have pieces” as an excuse to not play a quick game! Post-it notes, tape, even stickers can make up a quick checkerboard on the go! Camping? Use a stick to sketch out a quick game in the sand! Cut a sponge into a square. Dip it in any color paint you want, then press the painted sponge in a grid formation, leaving square space between each painted area, to create your board. If you want, you could take two sponges with different paint colors and press them on every other square-this is a faster way to get this made..
a simple kitchen sponge cut in half makes a great square shape for this purpose! Take shells, rocks, or any other object that you can get 32 of, and start marking them with half X’s and half O’s (we used a Sharpie) These will be your checker pieces. If you also want to be able to play chess, use the other side of your objects to write the specific piece names. Thank you for the honor! What a beautiful blog you have. Just stole this to share on FB later today!! And Pinned!! 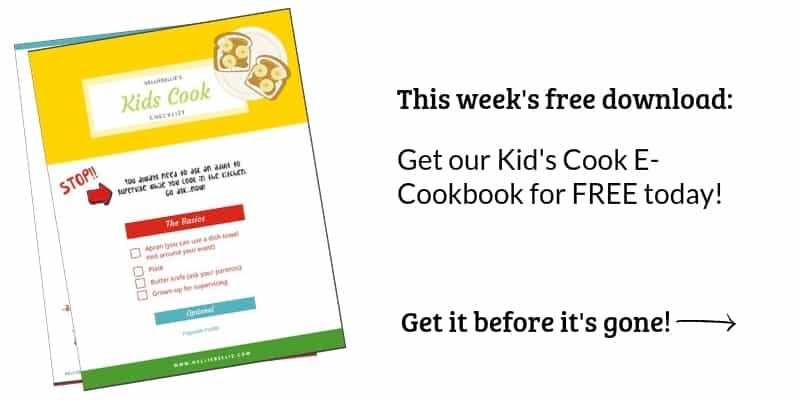 I love this clever idea!